The Baldessarini Ambré juice is the first to be constructed around a whisky accord, claims P&G Prestige. This is complemented by top notes of mandarin and red apple, leading to a heart of violet, offset by a leather accord. 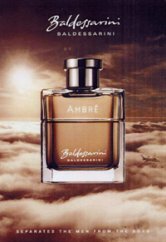 Baldessarini Ambre is available in 50 and 90 ml Eau de Toilette, and in Deodorant, Shower Gel and After Shave Balm. I think it's pretty clear that Amber is hot. Brown is the next purple, yep.